The Houston Rockets have come across a fantastic strategy: always win every game. It's a fantastic plan and it's amazing nobody else came up with it first. Apparently it's the brainchild of James Harden, Chris Paul and Clint Capela, who are an unbelievable 27-1 when they all play. The Minnesota Timberwolves hoped to add another loss to that record and push themselves a little closer to the San Antonio Spurs in the standings. Unfortunately for them, the Rockets had no interest in that arrangement, and instead went with their first instinct: to win. The Rockets aren't going to upend history by running the table and ending the season on a 35-game winning streak. They'll certainly be the favorite on any given night, but the reality is that their plan just isn't always going to work. Right now, it feels like they might never lose again. As soon as they lose a game, that feeling will instantly travel light-years away. That's no reason, however, to back down on their game plan, to stop their train from rolling. Until it stops working, just win each game. Pretty simple. It helps when James Harden chips in 34 points on 10-20 shooting as well as 13 assists. His single turnover is somehow the most impressive stat on a night when he quietly and efficiently dominated his opposition. There aren't many players who could make 34-13 look sedate, but James Harden has a unique pedigree. Clint Capela had a big night as well, notching a double-double in the first half alone. He went to town on Karl-Anthony, ending the night with 14 points, 12 rebounds and 71% shooting. He was all too happy to sneak around for some alley-oops, and his trusty guards were all too happy to let those oops fly. If this is the Clint Capela that keeps showing up to games, the wins will keep coming. This game was, overall, a team effort, with six Rockets scoring in the double figures. By the end of the night, they had made 22 out of 47 attempted threes, burying a Timberwolves team who attempted only 23 and made only 6. The Wolves were able to teak an early lead, but the Rockets stormed out in the second quarter and then never looked back. 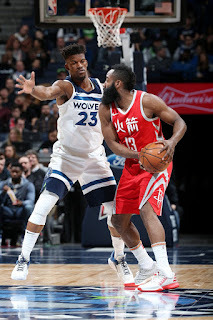 Most of the second half saw the Wolves down by double digits, and they simply didn't have the scoring necessary to survive whenever the Rockets went on a three point shooting run. ANd in the end, it was a three point shot From Harden that put the Rockets up 16 with four minutes left, shutting the door in Minnesota's face. The Wolves are a good team. They'll almost certainly end the season with home court in the first round. They also just didn't have enough to hold back the Rockets once they decided they wanted to win. Maybe they should get on board with the "Just Always Win" plan, too.